A group of protesters confronted Homeland Security Secretary Kirstjen Nielsen as she ate dinner at a Mexican restaurant in Washington, D.C. on Tuesday night, shouting insults and heckling her for several minutes. Metro D.C. Democratic Socialists of America, a socialist organization, claimed responsibility for the protest, and said a diner tipped off the group that Nielsen was eating at MXDC Cocina Mexicana, the New York Times reported. About 15 activists arrived at the restaurant around 8 p.m. The protesters chanted "shame" and "end family separation" at Nielsen, who looked down and appeared not to respond to the protesters during the almost 11-minute video. "How can you enjoy a Mexican dinner as you're deporting and imprisoning tens of thousands of people who come here seeking asylum in the United States?" a protester yelled at Nielsen. "We call on you to end family separation and abolish ICE [U.S. Immigration and Customs Enforcement]!" The secretary exited the restaurant shortly after demonstrators were shooed out by police, according to Metro D.C. Democratic Socialists of America. The activists were protesting the Trump administration's immigration policy, especially its practice of separating immigrant children from their families when they are apprehended for crossing the border illegally. The administration has implemented a zero-tolerance policy toward illegal border crossings, charging all individuals who cross the border illegally, including those who claim to seek asylum, with unlawful entry. Because federal law prohibits kids from being held in the same detention facility as those charged with unlawful entry, border patrol agents have separated children from their detained family members. Nielsen, who is responsible for carrying out President Donald Trump's immigration policy, has said that people seeking asylum should go to a port of entry rather than enter the U.S. illegally. Department of Homeland Security press secretary Tyler Q. Houlton tweeted that Nielsen was in the middle of a "work dinner" when the protests began. He added that "the Secretary and her staff heard from a small group of protestors who share her concern with our current immigration laws that have created a crisis on our southern border." Margaret McLaughlin, a member of Metro D.C. Democratic Socialists of America's steering committee, released a statement on the incident. "We will not stand by and let Secretary Nielsen dine in peace, while she is directing her employees to tear little girls away from their mothers and crying boys away from their fathers at our border," McLaughlin said, adding that, while Nielsen's dinner "may have been ruined, it is nothing compared to the horrors she has inflicted on innocent families." Nielsen answered questions about the administration's border policies at a press briefing Monday, leading Trump to praise her performance. 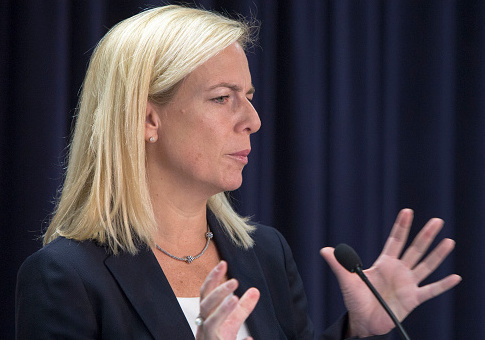 Homeland Security @SecNielsen did a fabulous job yesterday at the press conference explaining security at the border and for our country, while at the same time recommending changes to obsolete & nasty laws, which force family separation. We want "heart" and security in America! This entry was posted in Issues and tagged DHS, Illegal Immigration, Kirstjen Nielsen, Protests, Trump Administration. Bookmark the permalink.